By the mid 1960’s scooter sales led by the likes of the Lambretta and Vespa had already peaked in Britain. The emphasis of the scooter had begun to change from a commuter vehicle originally intended to get a place of work to one now more suited for leisure. As it did ownership shifted to the younger generation whose appetite for speed and power was a must. Soon enough shops began to cater for this new fashion offering tuning services as a new era of the scooter scene dawned. Before long competition amongst owners to be the fastest intensified and found a new outlet in the form of circuit racing. This was the real catalyst for both road going and track scooters as development continued at a fast pace. Though production of the Lambretta ceased in 1971 the Vespa survived despite the continuing down trend of two wheeled sales in general. This pushed the scooter scene underground but despite doing so the passion of tuning them continued to flourish. With the release of Quadrophenia towards the end of the decade a new injection of devotees were keen to join in and in doing so Lambretta and Vespa ownership increased significantly. Shops and business opened up in droves as the scooter tuning market turned lucrative over night. Soon enough companies began heavily investing in the production of all manner of products to serve owners needs. With the introduction of the TS1 cylinder kit for the Lambretta and the T5 Vespa by Piaggio in the mid 1980’s this would cement not only scooter ownership but take the tuning scene in a new direction. This was the period where the pure Lambretta and Vespa Street racer came to the forefront. With owners prepared to blow huge budgets, stunning creations took these machines to a new level. 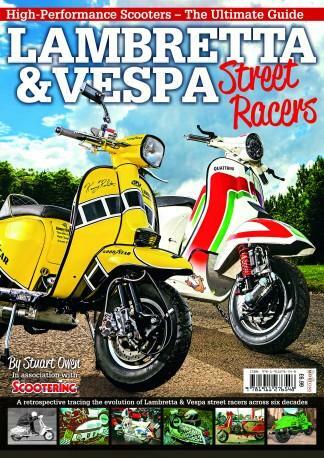 With continued investment from manufacturers and the competition still as strong the Lambretta and Vespa Street racer scene continues to thrive. This is the story of its evolution from the 1960’s to the present day. Be the first person to tell us what you think about Lambretta & Vespa Street Racers and you'll save £2.50 on your next purchase!